Do you enjoy TED style talks? Are you interested in developing skills in communicating science in an engaging, accessible way? Apply to present a brief TED style talk on the scientific topic of your choice. 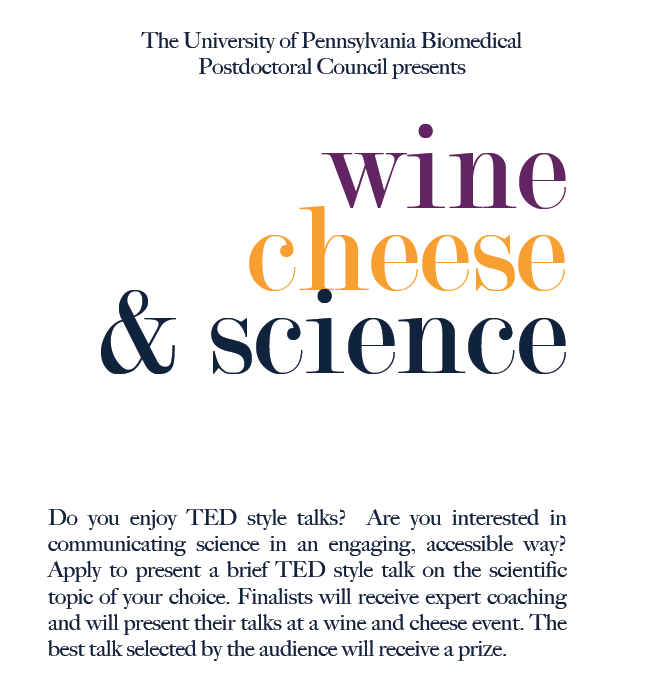 Finalists will receive expert coaching and will present their talks at a wine and cheese event to be held 9/10/15 from 3:30-6 pm. The best talk selected by the audience will receive a prize. We are now accepting applications through 8/10/15 at http://goo.gl/forms/JThm66w6Ix. Applicants must be BPP affiliated postdocs, and must be available to present their talk on 9/10/15, 3:30-6 pm. The deadline is coming up, so submit your entry soon! Info on upcoming events including the inaugural Science Writing Competition for Penn postdocs, monthly postdoc lunch, and postdoc welcome sessions. I guarantee that every scientist you have ever encountered can recall the person who inspired him or her to embark down the long and winding road that is science. From the quirky high school chemistry teacher with the best analogies for remembering the types of chemical bonds to the biology professor that illuminated the astounding complexity of the smallest cells comprising a human body, there is one thing that these figures had by the truckload – the genuine, infectious, and absorbing enthusiasm for one’s subject matter that can’t help but spread. From my seat at the bar with a cold beer in hand, I smiled as I saw flickers of those same candles being lit at the Pint of Science event at National Mechanics in Old City. Pint of Science is a global science celebration that occurs over three evenings in May in cities around the world. The organization was birthed in 2012 by two scientists in London, Michael Motskin, Ph.D. and Praveen Paul, Ph.D., whose simple goal was to make scientists more accessible to people. At the same time, Parmvir Bahia, Ph.D. and David Basanta, Ph.D., two researchers who were also keen on communicating the importance and excitement of cutting edge science to the public, started the American branch in Tampa, FL. At the core of Pint of Science is the notion that a child-like curiosity and enthusiasm can be ignited in adults given the opportunity (and the beers) to sit down and listen to an expert talk about their field in an engaging and interactive manner. The beauty of the event at National Mechanics was that it extracted this feeling of wonder by starting as big as you could start, with Penn graduate student, Nicholas Galitzki, whose thesis involves working on a giant balloon borne telescope (BLAST or Balloon-borne Large Aperture Submillimeter Telescope) that would record the spectrum of emissions from star forming cores in an attempt to trace back to the earliest stages of star and planet formation. Basically, when a new star forms, the interstellar medium – the opaque dust and gases that fill the universe – blocks the visualization of the formation event in the visible light spectrum. 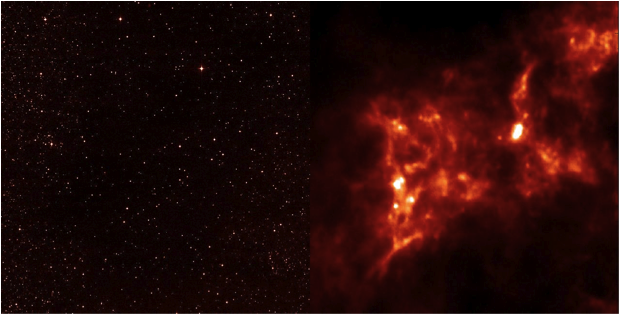 He explained, with many pictures, how the telescope allowed the visualization of a specific submillimeter wavelength of emitted light that only occurs in these specific high-density regions where the stars are forming. What made his talk even more interesting was his accounts of several expeditions to Antarctica that he taken with the BLAST team to launch the balloon. Surprisingly, he mentioned that the food at the research site in Antarctica is very good. In the end, he left us with a Sagan-esque reflection – that humans essentially came to be out of a cycle of star birth, death, and re-birth and we are all made of stardust. 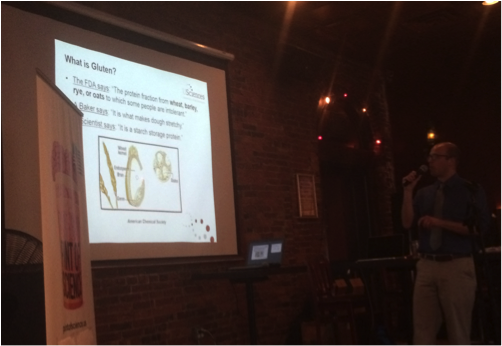 The next memorable talk was by Dr. Matthew Farber, a post-doctoral fellow at the University of the Sciences and Director of Brewing Sciences. 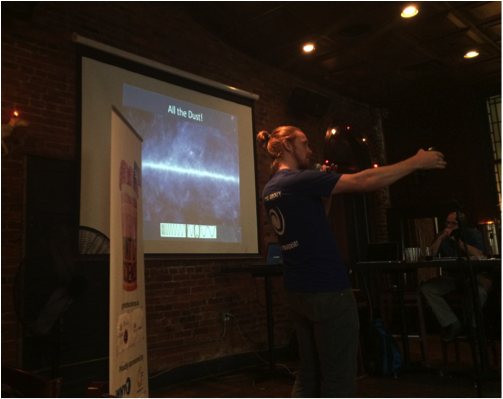 In contrast to the previous talk about the universe, Dr. Farber’s talk took us down to the molecular level to examine the very liquid that filled our cups – beer. He took us through the beer brewing process from malting, where the grains are made ready for brewing by releasing the starches, to mashing, wherein the released starches are converted into sugars, to fermenting, during which those sugars are turned into alcohol and carbon dioxide by the added yeast. Everyone laughed when he emphasized that we were essentially all drinking yeast poop. One of the Farber Lab’s interests is how we can remove gluten from beer so that people with Celiac’s Disease can enjoy it as well. This problem was something that his team and others have been able to solve through some pretty cool science. Basically, they have engineered a protease that can specifically cleave the gluten molecule and can simply be added to any beer to make it gluten-free. Now, this sounds simple to a scientifically geared reader such as a post-doc, but could be a complex idea to convey to your standard bar crowd. I was impressed with the way that Farber was able to clearly and succinctly convey the mechanism of action of the protease to this audience without omitting any of the relevant science. I felt that this accessible example was a great analogy to get people thinking about how harness the power of science can be harnessed to solve all kinds biomedical problems. Additionally, in the context of the modern day phenomenon to be gluten-free by choice or trend, it was a nice reminder to keep science in mind when making decisions such as whether or not to eat gluten. The last talk by Dr. Lynnette Regouby, a post-doctoral fellow studying the history of science itself at the American Philosophical Society Museum, was a great way to end the night in that her studies focus on how science has been practiced by humans since the very beginnings of recorded history. Now, if it doesn’t awe a person to reflect upon how much knowledge the human race has accumulated about the world through science and the ever evolving thought process that runs in parallel, I don’t really know what can. She specifically focused her work on the history of botany and how the discovery of “plant monsters”- venus fly traps and the like – in the 18th century caused scientists to question the classification system of plants that had been created thus far and had forced the community to rethink the nature of the relationship between plants and other living beings. It was again a sentiment that is still so relevant in modern day science. Undoubtedly, as rapid technological advancement allows us to reveal more truths about our world, both about the universe beyond the Milky Way’s boundaries and about the molecular inner-workings of our own cells, we will be forced to reshape and rethink many of our current views. I left with a feeling of hopeful wonder, feeling somewhat small (as one does when presented with the utter vastness of the universe), and feeling appreciative of the all the scientists who are dedicating their lives to unraveling the universe’s many mysteries, which scientists know only multiply the more you think you know. I hope that the infectious enthusiasm behind each Pint of Science speaker around the globe sparks these little flickers so that, at the very least, the wonders of scientific discovery and curiosity for the world around us lingers even in adults. 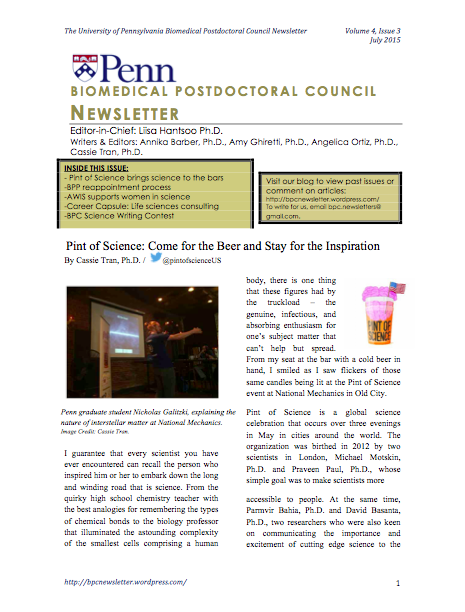 Pint of Science holds events across the US and Europe – see their website for more details! Congratulations, you’ve made it through a whole year as a postdoc! Whether this was your first year out of graduate school or you’ve been at Penn for longer than you care to remember, there are a number of items that should be on your to-do list around the anniversary of your first day. This article will outline the steps you need to take to ensure the smooth and successful renewal of your postdoctoral contract. First, you will need to work together with the Business Administrator and your PI to draft your official letter of reappointment. For this reason, it’s a good idea to give your Business Administrator a friendly reminder that you’re due for a renewal approximately a month prior to the expiration of your previous appointment term. Postdocs are not on a regular hiring schedule, so it can be difficult to keep track of when every individual is due for reappointment, so this will give them time to begin drafting your reappointment letter and get you updated in the system for the next year. The renewal letter should be quite similar to the one you received when you were initially hired, and contain certain pieces of information to ensure that you, your PI, and your department are all on the same page. These include the length of your reappointment term (generally, one year), your salary (which should increase yearly, and be in accordance with NIH guidelines- http://grants.nih.gov/grants/guide/notice-files/NOT-OD-15-048.html), and your health insurance coverage. Make sure both you and your PI sign the letter, and keep a signed copy for yourself in the unlikely event of any discrepancies. For reference, the template for the standard reappointment letter used by most biomedical departments at Penn may be found here: https://www.med.upenn.edu/postdoc/appointment.shtml. In addition to your contract, several other elements essential to your life at Penn must be renewed on a yearly basis. Chief among these is your PennCard, for which you will begin receiving email reminders to renew approximately one month before it expires. Keep in mind that your Business Administrator must update your information in the Penn payroll system before you will be able to renew your card. Give them at least 48 hours notice prior to your card’s expiration date, as it can take that long for the system to update and you don’t want to be stuck without an active PennCard while waiting for the paperwork to go through. Once the update is confirmed, you can go to the card office and renew your PennCard in the same way your first obtained it. Note that the office recently changed to a new system, and you may be required to take a new photograph upon renewal. Around the same time, you will also begin receiving reminder emails to update any training requirements in KnowledgeLink (http://knowledgelink.upenn.edu/) that must be renewed on a yearly basis. As biomedical scientists, we are required to update our Penn Profiler Training Assessment every year, a survey which determines what training is necessary given an individual’s role in the lab. Based on the results of this survey, you may be assigned several types of safety training, such as IACUC training if your lab works with live animals, or radiation training if your lab works with radioactivity. While many of these training sessions are one-time only, or good for multiple years, other types of laboratory safety training must be taken yearly, and your Penn Profiler results will assign you the appropriate courses in KnowledgeLink. The final item on your reappointment to-do list is the Individual Development Plan, which just this year became mandatory for all postdocs upon renewal of their contracts. The IDP is way for postdocs and their PIs to take stock of their performance, mentorship, and plans for the future on a yearly basis. In general, a good IDP should have 3 basic parts. First, an individual assessment by the postdoc, pointing out the strengths and weaknesses of their work over the past year, assessing the support and mentorship they received from their PI, and defining their future career goals (at the current moment in time). Concurrently but separately, the PI should address a similar set of questions, discussing how they feel the postdoc has been performing, how their mentorship has succeeded or could be improved, and what they see as the postdoc’s current career goals. Finally, the postdoc and PI should meet, read each other’s assessments, and have an honest discussion about the similarities and differences between the two. While positive mentor-mentee relationships may find few surprises in the IDP, the exercise is beneficial nevertheless to ensure they stay on the same page going forward. For less successful postdoc-PI pairs, the IDP forces them to confront ongoing problems, and hopefully reflect on how to fix these issues in the coming year. A template is available at https://www.med.upenn.edu/postdoc/training_independent.shtml, but it is not necessary to follow this format exactly. The IDP is intended first and foremost to benefit the postdoc, so whatever format feels the most comfortable to each individual is acceptable. A copy of the IDP should be signed by both postdoc and PI and submitted to the departmental office upon completion. Speaking from personal experience, both my PI and myself found the IDP to be a very useful exercise, although I’m only one year into my postdoc and not yet beginning to think seriously about the next stage of my career. It ensured we were on the same page with regard to both my current research and future goals, and made it clear any areas where we felt there could be improvement. As time goes on and I begin to think seriously about moving on, the IDP will only continue to become more important to make sure I’m receiving the type of support I need to succeed. Overall, it’s a great way to take a moment at the time of your contract renewal to reflect on the previous year and take stock of your situation as you head into yet another year as a postdoc. Is funding bias a factor that’s holding women back in STEM? What really accounts for the wage gap between men and women in the sciences? Are there gender disparities not just in wage, but in scholarly recognition? These were a few of the complex issues that Cindy Simpson, M.Ed., Chief Business Development Officer of the Association for Women in Science (AWIS), explored in her May 8 talk at the University of Pennsylvania. The talk, organized by Penn’s Biomedical Postdoctoral Council (BPC), attracted a large crowd of postdocs interested in learning more about issues that women in science face. Simpson began her talk with information pulled from a recent U.S. report, “Understanding The Gender Gap in STEM Fields” (1). The report found that while women are earning terminal degrees in STEM in increasing numbers, women only hold 35% of tenured and tenure-track positions, and only 17% of full professor positions in STEM across the U.S. This large drop-off from junior level faculty to full professor is puzzling, and is currently under investigation by the U.S. Government Accountability Office. One potential factor that could account for the drop-off is funding bias. However, data from the NSF and NIH indicate that while women are marginally more successful than men in obtaining NSF funding, and men are more successful than women in obtaining NIH funding, the numbers are not significantly different. The lack of apparent bias, Simpson asserted, is due to interventions that have been put into place to reduce bias in funding awards. Simpson went on to explore the wage gap. 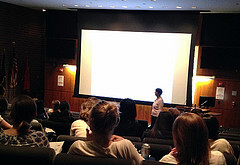 She presented recent data from the Bureau of Labor & Statistics (2) demonstrating a gender gap across STEM professions. What accounts for this wage gap? Simpson presented a few hypotheses. First, it could be that men and women accept positions in different industries, with accompanying differences in pay scale. Alternatively, there may be a difference in hours that women are able to work, given caregiving demands. This can be caregiving for children, or caregiving for other family members, such as an ailing parent. According to the U.S. Department of Labor, these caregiving responsibilities often fall to women, and women are more likely to work part-time to account for family responsibilities. Simpson referred to this as a “career cost of childbearing.” Department of Labor statistics estimate that over their careers, women lose $142, 693 in wages, $131,351 in Social Security, and $50,000 in pension income due to caregiving responsibilities (3). This sums to a loss of over a quarter million dollars for the average woman over her lifespan. With sobering numbers like this, steps need to be taken to investigate reasons for the pay gap and to work to reduce it. While the “career cost of childbearing” may be one contributor to the wage gap, it does not fully account for it. A study by Cornell economists found that 41% of the wage gap remained undetermined, after accounting for job type, education level, and number of children, among other factors (4). Digging down to search for the roots of the wage gap, some researchers have proposed that differences in scholarly recognition may play a role. Data collected by AWIS indicates women are significantly more likely to receive teaching and service awards, versus scholarly awards, compared to men (5). This is across physical, mathematical, biological and life sciences. As scholarly awards are often an important part of the promotion and tenure process, women may be at a disadvantage in this respect. AWIS proposes that interventions to promote more equal recognition in scholarly awards and prizes may help women to overcome barriers to success in STEM. Such interventions might include 1) Training award review committees in recognizing unconscious bias; 2) Changing language in recommendation letters for awards or promotions; or 3) Encouraging women to self-nominate or reapply for awards after an initial rejection. Interventions to reduce unconscious bias have shown an impact on award recognition for women, according to AWIS. Attention to language in recommendation letters is also key – the Gender Bias Calculator provides a useful metric for determining how many “masculine” versus “feminine” words are contained in a recommendation letter (6). Masculine words tend to be standout words (e.g. “extraordinary,” “unparalleled”), ability words (“intelligent,” “bright”), and research words (“data,” “method”), while feminine words are teaching words (“educate,” “train”) and “grindstone” words (“dependable,” “careful”). In the hiring and promotion process, as well as selecting award or grant recipients, masculine words may be more favored by selection committees. Thus, letter writers should be careful to use a mix of words that will be beneficial to the applicant. Finally, Simpson indicated that women may get in their own way by not self-nominating themselves for awards, which men are more likely to do. A woman may not apply for an award in the first place if she does not feel that she meets 100% of the selection criteria, while men are more likely to apply even if they do not fully meet the criteria. Women are also less likely to reapply for an award after a rejection, compared to men. The talk and Q & A was followed by a roundtable lunch, in which female faculty spoke in small groups with postdocs about issues like work-life balance and succeeding in STEM. Participating faculty included Dr. Kristen Lynch, Professor of Biochemistry and Biophysics; Dr. Rebeccca Simmons, Professor of Neonatology; Dr. Sara Pinney, Professor of Pediatrics; and Dr. Susan Weiss, Professor of Microbiology, as well as Dr. Kate Kadash-Edmondson, Senior Editor at Write Science Right. These small group discussions initiated meaningful dialogue between junior career women and more established senior faculty in how to promote and retain a robust STEM workforce. We hope to continue this dialogue; please post your comments in the BPC Newsletter blog comment section below (7). Also, stay tuned to the BPC website and Facebook page (8) to learn about future events related to women in STEM. The next BPC-sponsored Women in Science event will be a panel discussion with scientists and administrators at Penn, in October. Finally, check the AWIS National (9) and local (10) websites for more resources relevant to women in science. In Career Capsules, we provide a brief overview of a specific career path in the biomedical sciences. The following article was contributed by Dr. Adam Siebert, who received his Ph.D. at the University of Pennsylvania and now has a position as a Senior Life Sciences Specialist at L.E.K. Consulting. With funding opportunities increasingly reduced, many scientists are considering careers outside of academia. For those interested in transitioning to the business side of science, life sciences consulting may be a potential career path. Making the jump from academic research to management consulting is truly an intellectually exhilarating experience. By the time one has become a post-doc, he or she is likely in a field in which they are an expert and are comfortable with the daily requirements of the job. Post-doctoral fellows have demonstrated the ability to solve seemingly unsolvable questions by breaking complex questions into smaller, more manageable ones. By designing experiments to test hypotheses developed through reading literature and previous experiments, post-docs answer many smaller questions that get pieced together to solve a previously large and more complicated question. This is precisely the task of a management consultant, and more specifically, a Life Sciences Specialist at L.E.K. Consulting. A Life Sciences Specialist is part of a team that breaks down large, complicated business questions into smaller, more digestible problems. We conduct primary and secondary research to develop hypotheses that are pressure tested by experts in the field. Throughout this process, we synthesize our findings into strategic options that answer the large, complicated question that we’ve been tasked with answering for our clients. On a day-to-day basis, the life of a Life Sciences Specialist is different from that of a post-doctoral fellow. Typically, when Life Sciences Specialists first begin at L.E.K., they are responsible for understanding the scientific aspects of the project. For example, they would need to understand the mechanism of action, the clinical trial design and data, how it fits into the treatment paradigm and the competitive landscape. From there he or she would lead the interview campaign with relevant key opinion leaders and practicing clinicians. In some ways, it is not very different from the work of post-doctoral fellows. Life Sciences Specialists become the content experts. The main difference is that consulting work needs to happen very quickly and not at quite the same depth as in laboratory research. As one becomes more senior at L.E.K., the Life Sciences Specialist’s footprint expands. He or she will learn the business concepts relevant to the case and begin building financial models that inform the strategic recommendations made to our clients. While this transition to business may seem daunting, L.E.K. has a tremendous ongoing training program that is tailored to the background of an M.D. or life sciences Ph.D. For example, we have a week-long modeling boot camp that teaches skills in how to build financial models. At first, the training is geared toward business analytics, however the training expands into softer skills as one progresses in his or her career. One of the unique aspects of working at L.E.K. 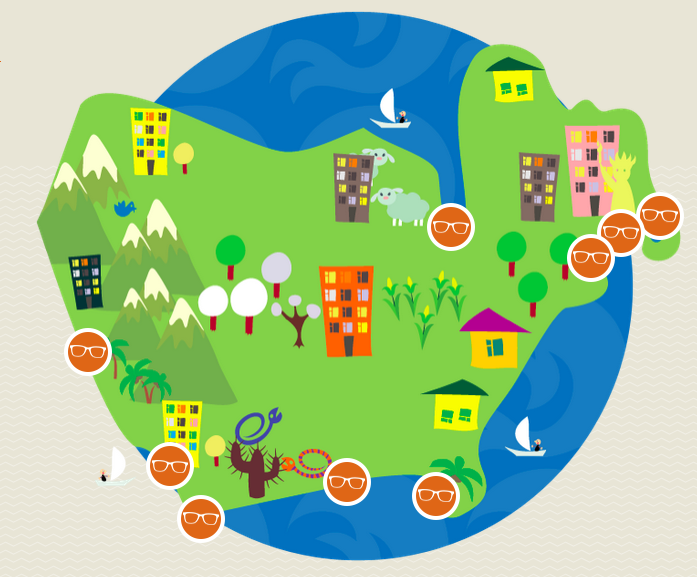 is the diversity of projects to which a Life Sciences Specialist is exposed. During my tenure at L.E.K., I have worked on more than 15 projects with start-ups, academic medical centers, private companies and small-, mid-, and large-cap companies that span the biopharma and med-tech industries. As part of these projects, I have learned about bioprocessing, vaccines, ultra-orphan diseases (e.g., mitochondrial disorders and urea cycle disorders), hypogonadism, oncology therapies, oncology supportive care, oncology molecular diagnostics, and specialty pharmacy. In addition to the various scientific areas, I have learned countless business concepts that inform strategic options, including market sizing, revenue forecasting, valuations, pipeline prioritization, reimbursement strategies, and clinical trial design. I have worked on projects that had an addressable market size as large as ~100M patients per year and as small as ~30 patients per year. On all of these projects, L.E.K. was able to make impactful recommendations to the client that will ultimately help get treatments to the market sooner, where they can benefit patients. When I started my career at L.E.K. Consulting, I was excited to begin a new chapter in my professional life and anxious to leave the familiar confines of my lab and university. While my anxiety has faded away, my excitement about the work I do at L.E.K. remains. Strategy consulting is a tremendously rewarding career that satisfies my intellectual curiosity both within science and medicine as well as business strategy. L.E.K.’s Life Sciences Specialist role is unique in that it allows the perfect marriage of these two areas while helping you to grow your career in business with multiple formal and informal career development programs. If you are like-minded and looking for opportunities outside of academia that combine these two areas, I would recommend looking into management consulting, in particular L.E.K. Consulting. Follow the firm on social media, try to arrange some informational interviews and attend recruiting events that are held at Penn each summer and fall.